A couple weeks ago, I was broadcasting seeds across a prairie we’d recently burned. The sun had just popped out after several days of cool rainy weather, and its warmth felt pretty good. As I crisscrossed the burned area, I noticed several large ant mounds. When I looked closely at those mounds, I was surprised at the large number of ants massed on top. 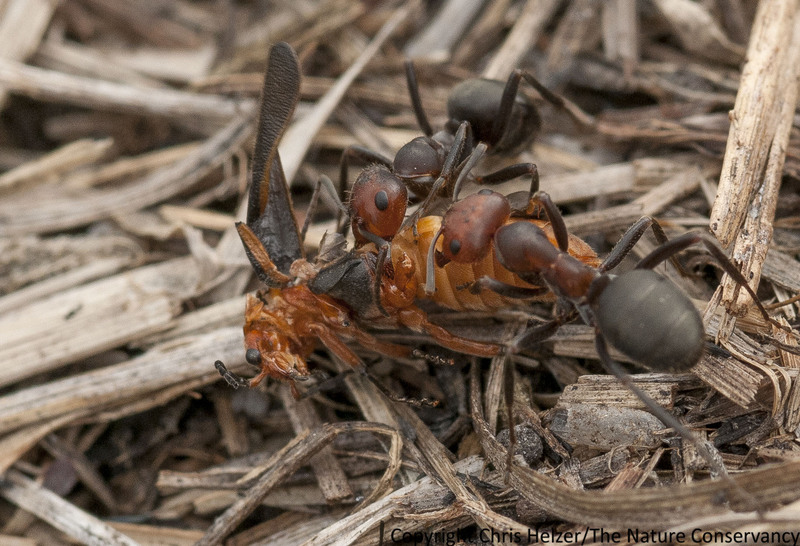 A few ants found a perch above the mob of ants beneath them on top of a large ant mound. Formica obscuriventris. TNC Platte River Prairies, Nebraska. Because it didn’t appear most of the ants were doing anything other than milling about, I surmised they were probably just enjoying the heat of the sun as I was. James Trager, who graciously identified the ants for me, supported my guess. 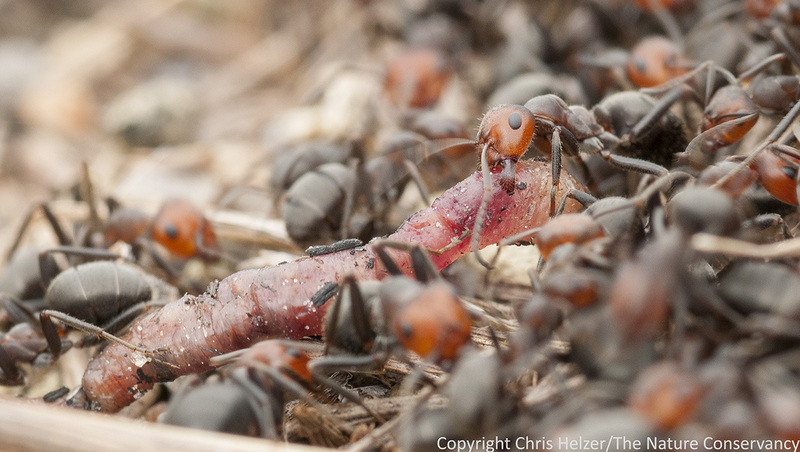 He added that this kind of thermoregulatory behavior is common, and not only warms the individual ants, but also the inside of the mound as those warmer ants go back into the tunnels. Mound building ants trying to drag a piece of earthworm into the mound. A spider being carried toward the mound. I enjoyed watching the ants, but eventually had to get back to work. 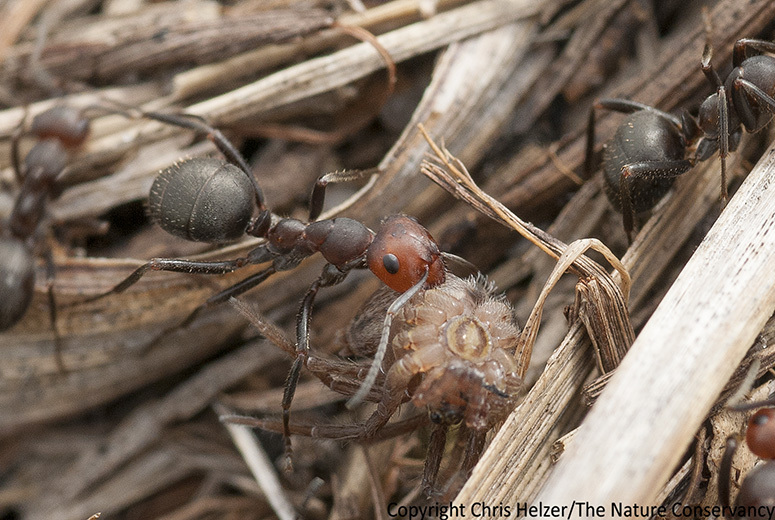 I was trying to help increase the plant diversity of the degraded prairie the ants are living in. 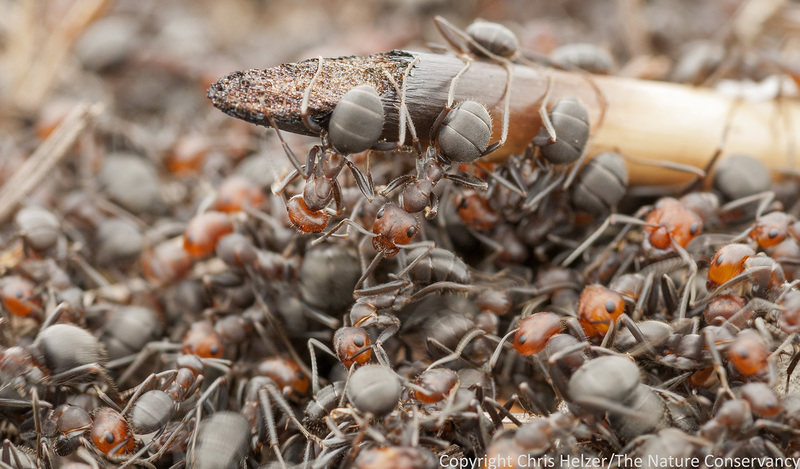 That broader range of plant species should help the ants in several ways, including by attracting a wider selection of insects for the ants to feed on. I hope so.